FILE - President Donald Trump speaks in the East Room of the White House in Washington, Jan. 31, 2017. The White House claims Trump's executive order blocking the settlement of Syrian refugees in the U.S. and temporarily barring entry to the U.S. for citizens of seven majority-Muslim nations is "lawful and appropriate." President Donald Trump responded Saturday after a federal judge temporarily blocked his executive order banning travel to the U.S. from several Middle Eastern countries, calling the ruling "ridiculous" and vowing to have it overturned. The judge, in the northwestern state of Washington, ruled Friday to temporarily halt the Trump directive, which sought to indefinitely block the settlement of Syrian refugees in the U.S. and temporarily block entry to the U.S. for citizens of seven majority-Muslim nations the federal government has designated as posing an elevated risk of terrorism. 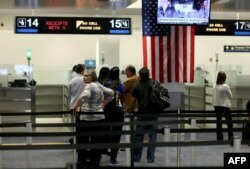 U.S. Customs and Border Protection has since said travelers with a valid visa will now be allowed into the country. An official with the U.S. State Department confirmed to VOA on Saturday that people with valid visas would be allowed into the U.S. and said the agency would release more information as soon as possible. “We have reversed the provisional revocation of visas under Executive Order 13769. Those individuals with visas that were not physically canceled may now travel if the visa is otherwise valid,” the official said. “We are working closely with the Department of Homeland Security and our legal teams." FILE - International travelers wait in line at a U.S. Customs and Border Protection checkpoint after arriving at Miami International Airport on March 4, 2015, in Miami, Florida. U.S. officials said on Saturday they would cease flagging travelers from certain countries targeted by the Trump executive order. The Homeland Security Department, in compliance with the judge's order, said Saturday that it would cease flagging travelers from certain countries targeted by the Trump executive order. Several major airlines, including Air France, British Airways and Emirates, began allowing passengers from the seven countries banned by the executive order to board planes destined for the U.S. Saturday morning. The White House issued a statement shortly after the ruling to say that the Justice Department "at the earliest possible time" will file "an emergency stay of this outrageous order." Shortly afterward, the White House issued a second statement without the word "outrageous." The statement also defended Trump's executive order as "lawful and appropriate." Trump also tweeted on Saturday morning to say America would be in "big trouble" if the country was "no longer able to say who can, and who cannot" enter its borders. Thousands of people in countries around the world took to the streets Saturday to protest the Trump executive order. People listen to speakers during a rally at the end of a protest march in London against U.S. President Donald Trump's ban on travelers and immigrants from seven predominantly Muslim countries entering the U.S., Feb. 4, 2017. 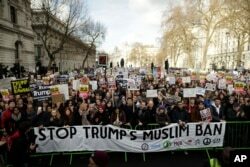 In London, a group of several thousand people gathered outside the U.S. Embassy, holding signs and chanting anti-Trump slogans. The protest was organized by several anti-racism and Muslim advocacy groups. Later in the day, protesters planned to march from the embassy in Grosvenor Square to Downing Street. Similar protests in Paris and Berlin drew smaller crowds of about 1,000 protesters each. In Australia, about 1,000 people rallied in the eastern city of Sydney to protest the executive order and call on Australian leaders to close the country's offshore refugee processing centers. A small group of about 30 activists gathered outside the U.S. Embassy in Indonesia to protest the travel ban as well. A few hundred protesters gathered in Philadelphia outside a building where Vice President Mike Pence gave a speech to the city's chapter of the Federalist Society, a conservative lawyers group. Another protest was planned at Trump's Mar-a-Lago estate on Saturday night. A Facebook post for the event said about 1,500 people would attend. Protests were also planned in Washington, D.C., and New York City. Protesters gather at Brooklyn Borough Hall to protest President Donald Trump's immigration order, Feb. 2, 2017, in New York. More protests are scheduled. U.S. District Judge James Robart in Seattle ruled Friday that the states of Washington and Minnesota had legal standing to challenge Trump's executive order. The Washington state government filed the legal challenge earlier this week, and Minnesota quickly joined the lawsuit. The two states won a restraining order while the court considers the lawsuit. “The Constitution prevailed today,” Washington state Attorney General Bob Ferguson told reporters Friday. He said the ruling immediately halted what he called “President Trump’s unconstitutional and unlawful executive order." A spokeswoman for the Department of Homeland Security said DHS does not comment on pending cases. The State Department was informed late Friday by the Justice Department of the state court ruling, according to an agency spokesperson. 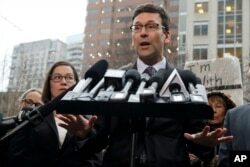 Washington Attorney General Bob Ferguson talks to reporters Feb. 3, 2017, following a hearing in federal court in Seattle. A U.S. judge on Friday temporarily blocked President Donald Trump's ban on people from seven predominantly Muslim countries. The State Department said fewer than 60,000 visas had been provisionally canceled as a result of Trump’s executive order. That number conflicted with one released earlier by Department of Justice lawyers, who said more than 100,000 visas had been revoked after the people they were issued to were blocked from traveling to the U.S. 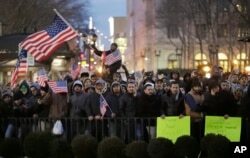 The State Department said the higher figure included diplomatic and other visas that were exempted from the ban. Trump’s order sought to ban visa holders from Iran, Iraq, Libya, Somalia, Sudan, Syria and Yemen. He said the measure was necessary to protect the safety of the American people from terrorists. The 100,000 number was revealed during a federal court hearing Friday in Alexandria, Virginia, in a case brought by two Yemeni brothers who arrived at nearby Dulles airport last Saturday. The brothers said they were forced to give up their legal resident visas and returned to Ethiopia. During the proceeding, the Department of Justice lawyers said they did not know how many people had been sent home as a result of the ban but that green-card holders had been allowed entry to the U.S.
Judge Leonie Brinkema commended the government for trying to bring Tareq and Ammar Aqel Mohammed Aziz back to the U.S. She also encouraged the government to consider how it might resolve such cases more broadly. “I have been on this bench a long time. ... I have never seen such a public outpouring before,” Brinkema said, adding that this order “touched something” in people like she had never seen before. Brinkema previously presided over the case of September 11, 2001, terrorist attack conspirator Zacarias Moussaoui, another case that sparked considerable interest. Brinkema extended her stay on deportations for another week, having also agreed to hear a lawsuit brought by the state of Virginia that questioned the constitutionality of the travel ban. Thursday, a federal judge in Brooklyn, New York, stayed deportations until February 21. Numerous other cases around the country are contesting the legality of the travel order.